Okay, so I know I am late with the black eyed pea dish, but better late than never. 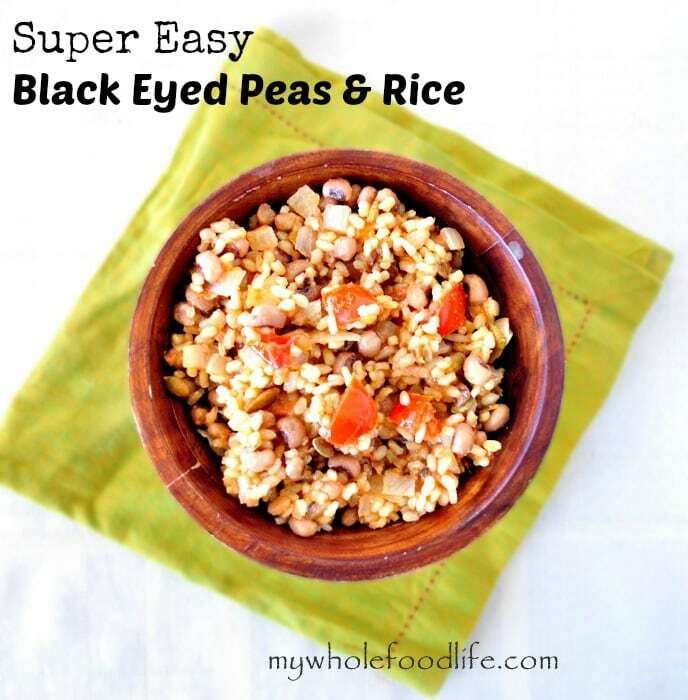 Here are some Super Easy Black Eyed Peas for you. I know traditionally black eyed peas are eaten on New Years Day for good luck. In fact, we did eat this dish on New Years Day. I just never anticipated it would be good enough to blog about. It was awesome. In fact, we may eat this next New Years Day as well. You should too. It’s yummy! This is another one of my husband’s creations. He also has come up with Acorn Stuffed Squash with Wild Rice and Peanut Noodle Stir Fry. I just love the simple ingredient list for this recipe. You probably already have most of the ingredients to make them! Who says you only have to have black eyed peas on New Years? They are great all year round. I filmed a short video for this recipe below. For more videos, you can subscribe to my You Tube Channel. An easy meal with very few ingredients! In a saute pan , saute the onions and oil for about 5 minutes. Then add in the cooked brown rice, tomatoes and black eyed peas. Lower heat, add salt and simmer for about 10 minutes. Remove from heat, add in the pepitas and serve. This should last in the fridge for about a week. It can be frozen for longer storage. This sounds awesome! I am a big fan of beans and rice, but never thought to use black-eyed peas. I'll definitely be giving this one a try :). Thanks Hannah! I hope you enjoy the recipe. I love black eye peas, but never heard they were good luck when eaten on New Year's. Good to know. I eat them all year round and I'm definitely going to try this recipe. Thanks Juney! Yes, I had never heard that before I got married. Maybe it's a southern thing? My husband grew up here in Texas, but I grew up in Boston. I made it today with a can of Rotel.It was amazing! Thanks for sharing! As a southerner I am very friendly with BEP&R. We also add cold crisp raw onion wedges on top to garnish. (1/8 of 1/2 of an onion is about size to cut onion up. Maybe a little hot sauce. I do flavor my beans with a little fried ham with onions and garlic and cumin. A new addition for me lately is making rice with coconut water and a little shredded coconut. Yum yum. Add the cornbread and I'm in ecstasy. I guess you wod make without the ham. I have cut back to a third of h than I used to use. Weeding it down. 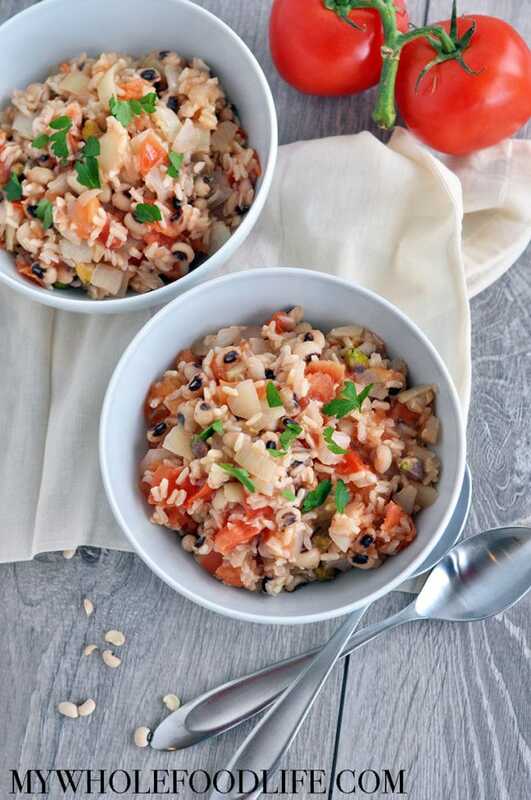 The coconut rice sounds heavenly! Thanks Tracy! I linked the canned black eyed peas in case anyone wanted to use canned. Eden Foods makes BPA free cans and that is why I chose them. I actually buy dried beans and peas myself. :) Much cheaper. I finally got a chance to make this - I used dried peas (thanks for the tips), & it really is easy& DELICIOUS! Thanks for all your great recipes! Do you have a tutorial/recipe on your blog for how you guys cook your dried beans/peas? Cooking dried beans is one of the few things in the kitchen that intimidates me. The few times I've tried either using directions on the bag or off the internet, they've come out horrible. I'd really like to switch to using dried beans for cost and health benefits, but could really use some tips on the best ways to do so. I love your recipes and am excited to try this one. Thanks! I don't have one, but that is a great idea. I will try and write one in the near future. I made this and put them inside lettuce for lettuce wraps and it was a hit! Served it with your maple brussel sprouts too. Yum! Oh yum! I will be eating these with a lettuce wrap next time. Thanks for the idea! Glad you liked the recipe! The lettuce wraps sound great, I'll try that! I just made this for dinner tonight and I love it! Simple and healthy! I used fresh baby heirloom tomatoes and toasted my pepitas with a little shredded coconut. I think this would also be good with brown rice pasta or whole wheat! Yummy, thank you! You are so welcome! I love this recipe. So simple, but such flavor! Looks great! Do you have the nutritional macro btlreakdown of a serving size of the complete dish? Thanks!